HAMILTON, ONTARIO--(Marketwire - May 29, 2009) - The Honourable Tony Clement, Minister of Industry, today announced that the federal government will be supporting infrastructure projects at private institutions across Ontario through its Knowledge Infrastructure Program. As part of Canada's Economic Action Plan, the Government of Canada introduced the Knowledge Infrastructure Program, a two-year, $2-billion economic stimulus measure to support infrastructure enhancement at Canadian post-secondary institutions, including universities and community colleges. "Our government continues to support investment that provides significant short-term economic stimulus in local communities throughout Ontario, while at the same time strengthening Canada's long-term capacity for research and innovation," said Minister Clement. Canada's Economic Action Plan sets out to stimulate the Canadian economy over the next two years and to improve our long-term competitiveness through $12 billion in new infrastructure investment, which includes the $2-billion Knowledge Infrastructure Program. This new support is the next substantive investment in the Government of Canada's multi-year Science and Technology Strategy, Mobilizing Science and Technology to Canada's Advantage. For more information about the Knowledge Infrastructure Program, including program criteria, application instructions and a list of the approved projects to date, please visit www.ic.gc.ca/knowledge-infrastructure. The Knowledge Infrastructure Program is a two-year, $2-billion economic stimulus measure to support infrastructure enhancement at post-secondary institutions across Canada. The Program provides funding to support deferred maintenance, repair and expansion projects at universities and colleges, and responds directly to the need indicated by post-secondary institutions to improve existing campus infrastructure across the country. A major portion of this infrastructure is near the end of its projected lifecycle and, in many cases, does not adequately meet the needs of today's research and teaching activities. The Program has two components. The university component gives preference to projects that can improve the quality of research and development at the institution. The college component supports projects at other post-secondary institutions, such as colleges, publicly funded polytechnic schools and institutes of technology, which will strengthen their ability to deliver advanced knowledge and skills training. Projects are assessed according to their ability to quickly and effectively generate economic activity and support job creation. Project readiness and economic impact are, therefore, key criteria used in project selection. Projects are also assessed on their ability to enhance research capacity, support the attraction of new students and provide a better educational experience for the highly skilled workers of tomorrow. The Program will not only generate economic benefits and support job creation, but will also have an important positive net impact on the environment by reducing energy use, reducing greenhouse gas emissions and improving waste management at universities and colleges across Canada. Through the Knowledge Infrastructure Program, the federal government is investing $5.9 million to fund six projects at private post-secondary institutions in Ontario. 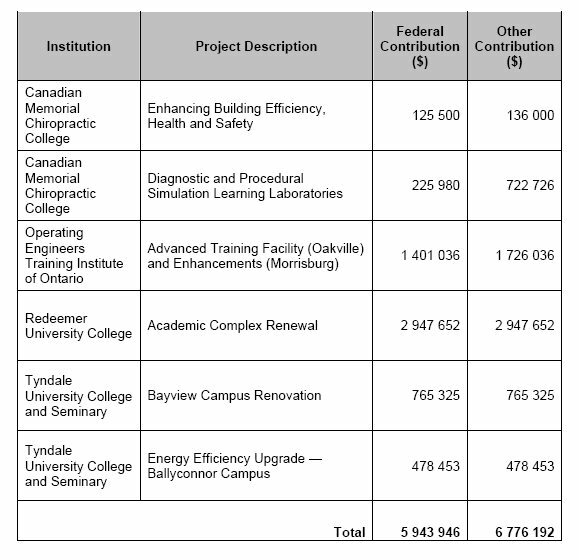 The institutions themselves are providing $6.8 million, leveraging a total investment of $12.7 million in infrastructure projects at these institutions. For information about a specific project, please contact the relevant institution. A table is available at the following address: http://media3.marketwire.com/docs/ictable.jpg.